There is one type of flour that passes the gluten free test: buckwheat flour! Here are some gluten-free buckwheat pancake recipes, along with tips for making the best buckwheat pancakes. Plus, lots more gluten free buckwheat recipes — because there’s more to make from buckwheat than just pancakes! See the latest food industry trends. Plus, all the best links to stay on top of the most recent food and restaurant trends. Eating in restaurants you’ve never been in before can be difficult for those on gluten-free diets. When you’re traveling and trying to find gluten-free foods when you dine out, some cuisines are easier than others — like Mexican food. In Page, Arizona, we stopped at a Mexican restaurant called Fiesta Mexicana. Here’s my review. Plus some great gluten-free beers! Tonight, I wanted to make spaghetti, but I didn’t have any spaghetti sauce. I also didn’t have all the things I needed to make it. So, I put together some things I did have and came up with a pretty good dinner. It is gluten free, and low in fat and sugar, so it was good for both of us. I learned to prepare lots of Mexican and Tex-Mex dishes when I was living in south Texas. I also learned to love the chipotle flavor there. Chipotle is a fully ripened and smoked jalapeno pepper, so adding it to your food gives it a warm, smokey flavor. 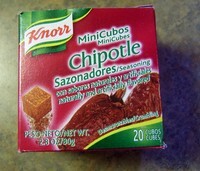 Here is my recipes for homemade gluten-free enchiladas using Knorr Mini Cubs Chipotle Seasoning.